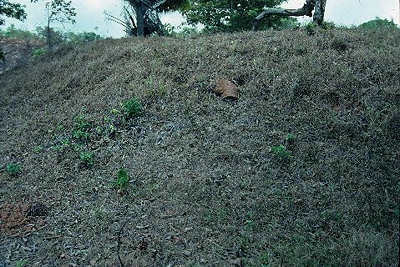 Nombre de Dios, Panamá Webster found the eroded earthen rampart on top of the hill that overlooked the east side of the original settlement. Here and unknown to Webster, two parts and not one of the burst cannon were found by a farmer who was prompted to search by Webster. I found one piece on the rampart and the larger part on top of the seaward and lower hill, called El Morro, to where the farmer dragged it in 1977. On the site of colonial Nombre de Dios, I unearthed pottery shards and ships' nails from the 1590s.